Gut loading and dusting are methods to boost the nutritional content of feeder insects prior to providing them to your animals for consumption. Animals that have been relocated, are ill or under stress would particularly benefit from gut loading and dusting. Gut loading is providing high quality foods to feeder insects so they take up beneficial nutrients for your animals. Most pet stores that sell reptiles are likely to sell a commercially available gut loading formula. As you only use a small quantity this is a relatively cheap option. Alternatively you can make it yourself as outlined at our website Reptiles as Pets. Providing energy rich fresh root vegetables (preferably not frozen) such as carrot and sweet potato will also provide a good wet food gut loading option. Remember to also provide a good supply of water either through a water dispenser or fresh fruit and vegetables. Where possible feed the crickets gut loading foods at least 24-48 hours prior to feeding them to your animals. This will allow sufficient time for the uptake of nutrients and moisture. Dusting is a process of adding nutritionally rich powder to the outside of your feeder insects. Again only a small amount is used so purchasing a commercially produced product is an economical way of adding nutrient to your animal’s diet. 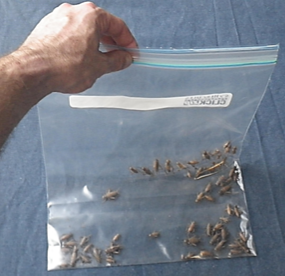 One common method to dust crickets is to place them into a plastic “zip lock” bag or into a small high sided container and shake until the crickets are completely covered. Crickets and cockroaches should be fed to your animals immediately after dusting as they clean themselves on a regular basis. Adding gut loading foods and/or dusting powders to your crickets and cockroaches are designed to “top up” nutrients and should not substitute feeding your animals a nutritionally balanced diet. 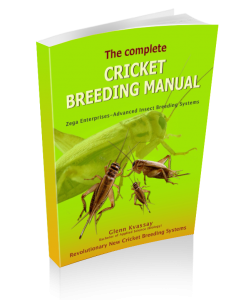 If crickets are fed a high quality diet, then dusting and gut loading for the most part will be of secondary importance to your animals (with the exception of a few trace nutrients which can only be provided by dusting). 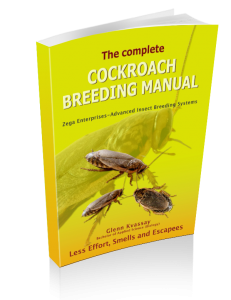 Our Insect Breeding Manuals provide a number of techniques to quickly and efficiently grade your crickets (sort them into different size groups), gut load/dusting and how to store them temporarily so they are readily available at all times.